Allen L. Eads, 62, Wabash, passed away at 8:50 a.m. Jan. 17, 2019, at Parkview Wabash. One of five children, he was born on April 13, 1956, in Wabash. Four years after graduating from Manchester High School in 1974, he married Cynthia Mimlitz. Together they had one daughter, Tara Eads; and one son, Mitch Eads. Later he married Renee Copeland in 1994. They had three daughters. He had a true love for the outdoors. 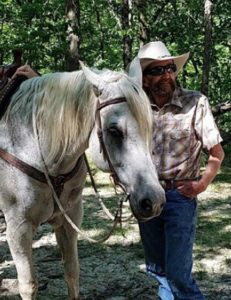 For those who knew him they knew the passion he had for hunting, fishing, and most of all trail riding on horseback with friends. He also loved driving big trucks. This could be seen by the jobs he had in his life. From 1996 to 2001 he drove trucks for Freeway Trucking. He then moved on to driving for Eads & Son Bulldozing Inc., Lagro, and was there for the last 18 years. During the last two years, he also worked for Quinn & Sons in Urbana, driving dump trucks. The loving memory of Mr. Eads will be carried on by his mother: Arlene (Cormany) Keirn; his son: Mitch (Laura Hand) Eads, North Manchester; four daughters: Tara Eads, Fort Wayne; Laci (Gregory) Welch, Colorado Springs, Colo.; Krystal Eads, Wabash; and Christina Shrock, Wabash; one brother: Steven A. Eads, North Manchester; three sisters: Andrea Eads, North Manchester; Sylvia Eads, Warsaw; and Laura (Mike) Leisure, North Manchester; and eight grandchildren. He was preceded in death by his father: Porter L. Eads; and one grandchild, Azlynn Morris, who passed away in December 2018. Family and friends may call from 2 to 5 p.m. and 6 to 8 p.m. Tuesday, Jan. 22, and one hour prior to the start of the service on Wednesday at McKee Mortuary, 1401 State Road 114 West, North Manchester. Funeral services will begin at 11 a.m. on Wednesday, Jan. 23, at McKee Mortuary. Doug Pennington and Jon Hiple will officiate. For those who wish to honor the memory of Mr. Eads, a love offering may be made to McKee Mortuary, 1401 State Road 114 West, North Manchester, to assist with final expenses.